The Cucurbitaceae family contains about 1000 species in 96 genera. Representatives of all genera (except the extinct Khmeriosicyos) and a large percentage of the species have been sequenced for the ribosomal RNA transcribed spacer regions and variable regions of the plastid and mitochondrial genome. These data have allowed to infer evolutionary relationships in the family. The major phylogenetic structure of the family is now clear, and this chapter includes an up-to-date phylogenetic scheme with the placement of all genera. The Cucurbitaceae clade originated in mainland Southeast Asia sometime in the Late Cretaceous, and the five deepest evolutionary divergences in the family all date to the Late Cretaceous, 70–80 Ma. Two of these ancient clades, the Gomphogyneae and Actinostemma, are now almost restricted to Asia. A third ancient group, the Triceratieae, is mainly Neotropical, except one African genus; other clades and tribes are more widespread. 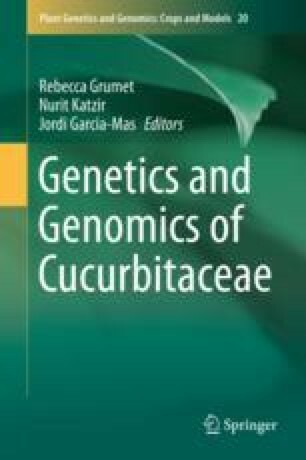 The economically most important genera are concentrated in the Cucurbiteae and Benincaseae, and species of Cucumis and Citrullus, with well-annotated genomes, therefore have largely comparable (homologous) linkage groups. In contrast to the relatively good data on the family’s phylogeny, data on its ecology, physiology and morphological evolution are scarce and collection and study of wild species, many of them in threatened habitats is much needed.